A residence for a young couple and their future family. 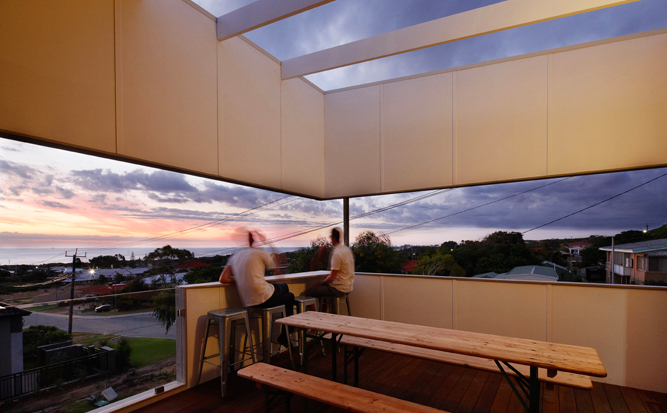 The project is conceived of as a combination of the humble qualities of a West Australian beach shack and the climatic and underside-utility benefits of a Queenslander. The house is lofted above a natural limestone outcrop which becomes a shaded garden terrain below the belly of the home above. 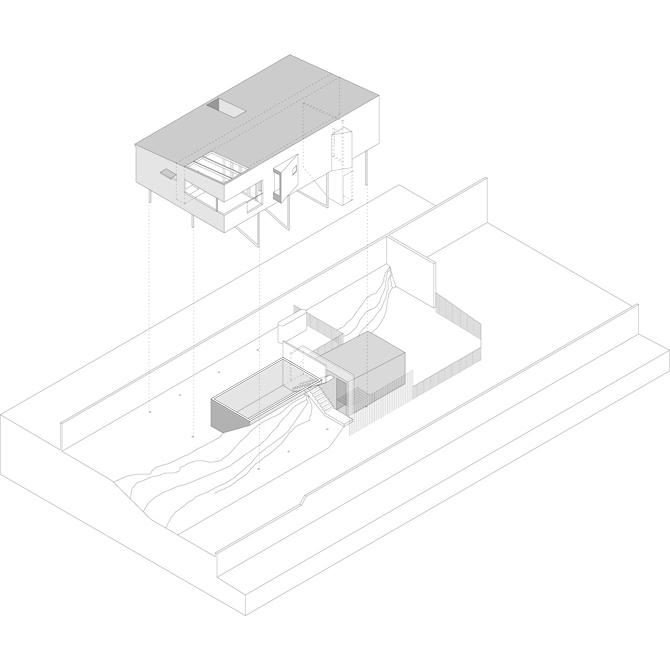 The plan of the house is rationally divided into day and night zones with the separating corridor fattening at one end to become a study nook. West facing windows are minimised to shield the house from the searing afternoon sun. This 'blankness' is regulated by two 'flicks' in the wall, one opening toward the south-west to scoop in the 'Fremantle doctor' for cooling and the other towards the north to frame a view up the coast and to monitor the driveway below. A generous outdoor room to the north-west capitalises on panoramic views of the Indian Ocean. A small room is tucked under the house at the rear, providing a flexible space that could be a 4th bedroom, back-yard pavilion, home office, or games room. Overall, it is a residence that challenges the conventions of detached housing in Perth: small, lifted above the ground, no front door, no garage, no front fence, no brick... a beach house in the suburbs.